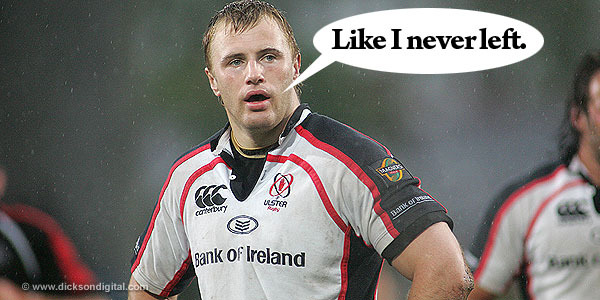 Roger Wilson is on his way back to Ulster. He’ll return home from Nortampton at the end of this season on a three year deal that’ll see him up to his 33rd birthday, and probably his retirement from the game. David Humphreys’s stint as whatever it is that he does up there is paying off in a big way. Wilson’s return brings another émigré back to Ravenhill, and there’s no doubt that they’ll be high amongst the bidders for the services of Tommy Bowe when his contract with the Ospreys expires, whether that be in summer 2013 [as reported] or at the end of the 2011-12 season [as rumoured – and hoped for – amongst Irish rugby fans of all provincial persuasions]. Capped by Ireland before he left Ulster, Wilson’s stint at Northampton has been a profitable one on the pitch: he’s racked up a huge amount of gametime and started a Heineken Cup final for the club, proving to be a key component of a well-coached side who are always in the mix for trophies. His return makes the province more Irish [eh, careful] in that it adds another quality Irish-qualified player to the line-up. While he has been away though, Pedrie Wannenburg has proved himself remarkably durable. Since his arrival Wannenburg has started 43 games in just over a season and a half, and his recent outing against Leicester in the HEC was a high-water mark for his time at the province. However, rumours are emerging that Ulster are in the market to replace him with a higher-profile back row, and the noose of speculation has tightened on Jerome Kaino. It seems unlikely because blindside is a position in which Ireland haven’t struggled to produce international caliber players in recent times [O’Brien, Ferris, Leamy, Easterby, Best, Quinlan to name only the most recent of the bunch] and Ulster are already luxuriously appointed with the best blindside in the northern hemisphere in Steven Ferris. However, as with all classic rumours, there’s just enough there to bite on if you want to be convinced – after all, John Afoa was Kaino’s best man at his wedding recently, and there’s every possibility that the big Kiwi No6 would be looking for a northern hemisphere payday having bagged the World Cup with the All Blacks. The real story is in the remarkable leeway afforded to Ulster’s NIQ signings by the PCRG [Player Contracts Review Group] of the IRFU. Peter O’Reilly’s recent article in the Sunday Times lifted the veil a few inches on the half-assed Machiavellian carry-on that takes place in the committee rooms of 10-12 Lansdowne Road, and went some way to revealing how it was that the European champions Leinster can only scrape together two internationals from their five non-Irish-eligible [NIE] players – and those two with a grand sum of two caps between them – whereas Ulster are able to attract no fewer than five internationals with 171 caps between them, including no fewer than three World Cup winners! From the oft-espoused Rory McIlroy story to The Mole’s favourite – ‘a syndicate of wealthy beef farmers’ [I’ve heard that one, I sh*t you not] – the rumours that Ulster are profiting from external investment has been given plenty of air-time, especially south of the border [down Mexico way]. Ulster brass are absolute in their denial of any and all rumours of this nature, leading to many an ‘Ulster says “No!”‘ punchline around Mole Towers, and maintain that the drastic improvement in their recruitment is down to better book-keeping, top-rank scouting and excellent negotiating. Whatever the truth of the matter, Wilson’s return can only be viewed as a positive. He’s a quality player in his own right, and it also signals that a player who left because the province hadn’t got their house in order now sees them as sufficiently potent that he’d leave a high-achieving English club to come home. This entry was posted in News and tagged Northampton Saints, PCRG, Roger Wilson, Ulster by dementedmole. Bookmark the permalink. Kaino signing would be huge. Possibly a bigger coup than Rocky. Love the “syndicate of wealthy beef farmers” rumour, definitely one I am going to spread, citing the very reputable Demented Mole as my source should anyone ask. “the European champions Leicester” ?? That rumour is nonsense. It’s darren Clarke who cashes dhump’s cheques. He used to play front row for dungannon, that’s how he met chubby chandler – scrummaging against him on a tour in England. He spotted afoa’s tighthead potential and got him in……. It would make sense to go for kaino if they were thinking of trying the Ferris to lock much publicised notion, but Dan tuohy’s form has made that less likely than it already was. He would be quite a signing to go with the other good signings, if only to give the nickname John two Afoa one…….ooooooh, that’s poor. Great article Mole. Any chance of Neil Best coming back too? The big hits of Stephen Ferrous without any of the control. I once saw him in a crowded bar in Hamilton after we’d bean beaten by the ABs, listening to a rugger hugger yammering-on for a few minutes before saying nothing, gently taking a handful of her hair and sniffing it with a slightly demonic look on his face. She didn’t seem to mind. … uuuunrelated- I reckon Kaino will stick with the Blues for a few more seasons to try and win Super Rugby. They have been serious underperfomers and if he was going to leave then surely immediately after the World Cup when his stock was at an all time high would have been the time to do it.